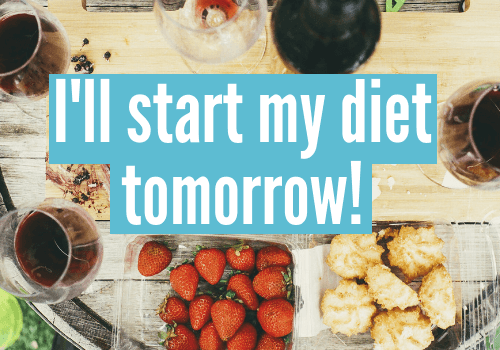 How to stop saying, I’ll start my diet tomorrow! While this is kind of hilarious, it also got me thinking: Why don’t we stick to the plan we’re on? And how can we stop mortgaging tomorrow’s happiness for today’s temporary enjoyment? That’s a big question—and it’s one we’re going to tackle right now. Trap #1: We take credit for tomorrow’s achievements today. The first trap we need to look out for is “sin today, salvation tomorrow.” It’s easy to think about all the hard work we’ll put in tomorrow and take credit for it now. Here’s what I mean: Have any of these thoughts ever crossed your mind? One cookie is OK—I’ll just wake up early and go for a run. Let’s order pancakes; I’ll start my diet on Monday. I feel terrible, tired, and hungry, and don’t feel like cooking anything… but that’s fine. I’ll hit the gym extra hard next week. If you’ve ever said anything like this, can I get an amen? Because I sure have. But the truth is, when we intend to make a healthy decision tomorrow, we’re far more likely to overeat today. Trap #2: We’re overly confident. Some of us are so confident that we’ll eat healthier tomorrow that we’re perfectly OK indulging today. In one study, individuals were asked to rate themselves based on how much self-control they think they have. And the funny thing is: Those that rated themselves as having high self-control were those most likely to order unhealthy meals. Now, you may be thinking, Well, that rules me out! I’d never say I have a lot of self-control. I clearly don’t fall into the overconfident category. Not so fast—overconfidence is a sneaky trap. Have you ever said you’re going order a salad for dinner, but got the burger and fries instead? (Cough, cough… I have.) So it’s not just about thinking you’re confident—it’s about how you really behave. Trap #3: We’re too optimistic about what we’ll do tomorrow. Today, life is hard: We’re overwhelmed, we have zero free time, we’re tired, and we don’t feel like eating healthy. But, tomorrow…well, tomorrow is always going to be different. Tomorrow, we’ll find time to go to the gym, make that hard decision to eat a healthy lunch, and skip those drinks with friends. It’s so easy to be convinced we’ll make great future choices—and excuse our present actions. Solution #1: Catch yourself before you fall. “I can intercept those thoughts and make better choices moment by moment.” Yes! That’s exactly what we’re talking about! When we find ourselves rationalizing all the reasons to indulge now, we can recognize that behavior, stop, catch ourselves, and avoid those pitfalls. Solution #2: Give yourself a reality check. We ask ourselves this kind of question not to make ourselves feel guilty—feeling guilty doesn’t help anyone. The point is to call out our excuses for what they are: rationalizations to make easy, self-sabotaging decisions. Solution #3: Realize that tomorrow is not easy. When we think about tomorrow, we imagine ourselves with more time, more willpower, and the ability to make better choices. What we’re doing is creating this “ideal image” of what tomorrow will look like, but here’s the flaw: Tomorrow will present the same challenges we have today. We’ll still have friends that want us to have a drink with them, be busy at work, feel anxious, and crave the comfort of food when we feel bored. The time to change isn’t tomorrow; it’s now! We can only avoid the discomfort for so long—we might as well make the change today. Solution #4. Make each day’s choice a copy of the last. Behavioral economist Howard Rachlin refers to this concept as “reducing variability.” What does that mean? Instead of changing our behavior, we double down on it. Here’s an example: Say we’re faced with the choice of having a doughnut or not. What usually happens next? We have this internal debate about whether we should have it or not. We’re at war with ourselves until one side wins. And usually, it’s not the side we want to win! Of course, this doesn’t mean you can’t enjoy your favorite food. Everything in moderation—even moderation. I believe in teaching clients how to be fit and happy, not fit and miserable. Sometimes, you just want something because it’s delicious, and that’s OK. I encourage you to enjoy your favorite food. The idea is to enjoy it with others… not use it alone. And don’t let one indulgence throw the whole day or week off. But what we decide to do today dictates what we’ll do tomorrow too. If we remove the idea that tomorrow is going to be different and recognize that our choices today are going to be the same as our choices tomorrow, it’s much harder to avoid facing the consequences. We can clearly see the real effect that each of our decisions has. So ask yourself, Do you want the result of eating a donut every day of your life? Of course not—so let’s decide that what we do today is what we’ll do tomorrow, and make great choices today. Are you struggling with “The Tomorrow Trap”? If so, I want to hear from you. More importantly, I want to hear what actions you feel like you can take to break the indulge today/change tomorrow cycle. And if you need help, this is what MyBodyTutor specializes in. Through daily support and accountability you can make this diet the last diet you’re ever on! 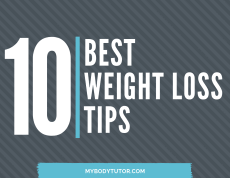 Do you know the #1 reason people are overweight? (hint: it’s not what you think). Ready to make tomorrow a thing of the past? Take our free 7-day mini-course.